Harris Environmental uses a wide variety of industry-standard software and reliable technology platforms to support our environmental planning, cultural resources, and natural resources services. Our team has a diverse background in geospatial analysis and product development. 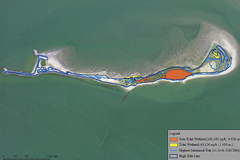 We use Geographic Information Systems (GIS), Geospatial Analysis, and Cartography to fully convey environmental, natural, and cultural resource information needed to complete projects and satisfy regulations and policies governing the use of project lands. LiDAR. Data collection and analysis for the high resolution three dimensional point clouds for the creation of precise DTMs and 3D models of the landscape. For use where tree canopy and dense surface vegetation would otherwise be a visual obstruction to the ground surface. Digital 3D Mapping. 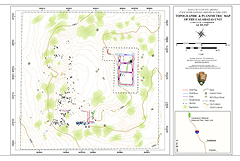 Documentation, and Analysis of Archaeological Sites and Historic Structures. Offers a novel alternative to traditional photographic documentation. A precise, high-resolution photorealistic model of a historical building or archaeological landscape can be used for archival documentation and dynamic visual display. Orthomosaic Imaging. Develop small scale, high resolution georeferenced imagery of the landscape for integration in GIS analysis and mapping. Digital Terrain Modeling and Analysis. Develop accurate Digital Landscape Models (DEM/DTM) for the creation of site-specific topographic maps of the landscape for use in slope analysis, hydrological flow analysis, and predictive modeling.